Our praise team leads us in worshiping through music each Sunday. 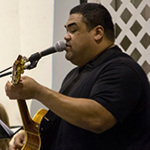 Shon, our worship team leader, is a gifted musician and songwriter. Here are a few of the songs he has written and recorded. “I truly believe that when the church worships together in music with knowing, sincere hearts, in that moment we are participating in conjunction with millions of living beings in heaven, in a powerful, miraculous event ordained by God and existing before the creation of creation. It is an experience that has the power to break the hardest hearts and change the most stubborn minds in an instant. In that moment we can experience the true and full passion of God, through Jesus Christ, in the most intimate and personal way and we are changed forever."